Another day of sunshine looks likely. 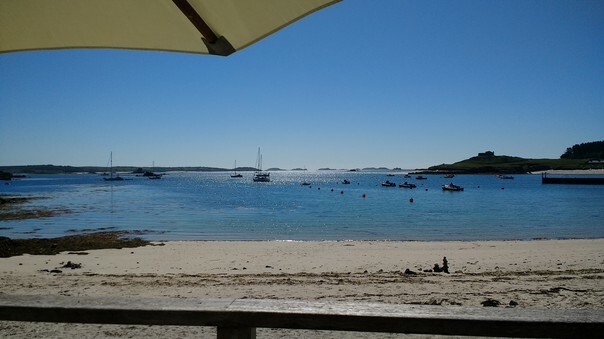 I take the dinghy ashore, walk uphill, then downhill to the other side of Tresco to Old Grimsby Harbour. I savour a cappuccino in the Ruin Beach Cafe and enjoy the view over the sandy bay where many yachts (mostly French flagged) are lying peacefully at anchor. Retracing my footsteps through the low rise time-share buildings, I find that the Anglican Church of St Nicholas has a Communion service just about to start. They are very welcoming but their first question is "Can you play the organ?" (where is L27 owner, sailor and organist, John Foreman, when needed?). Well known hymns are sung to to an organ sound produced by a "digital thingy". Unfortunately the "thingy" adds long pauses between hymn verses so those who have closed their hymn books after verse one were left scrabbling to catch up as the "thingy" launches into the next verse. Naively, I thought that between the islands, there would be a regular water taxi service which let me visit all the islands without having to keep moving Dark Star. However, trips to various islands usually take place in the morning and you are left on the island until picked up much later in the afternoon. Since there is only one true deep water channel in the Scillies (the sound between St Mary's and St Agnes) access to other islands is dependent on the tide and the wind. Timetables are published on chalk boards, on the day. It's pretty ad hoc. While chatting after the service in St Nicholas one local suggested taking the "jet boat" which was fast, of shallow draft and could reach parts other boats could not. At 2.30, jet boat "Lightning" turned up at New Grimsby Quay and with around a dozen passengers, roared off on a near two hour trip around the Scillies. The young skipper was certainly not a seasonal immigrant worker but a a local boy and proud member of the the St Mary's Boatmen's Association. He found seals, large jellyfish, porpoises, razorbills and guillemots, but unfortunately no puffins. It's remarkable how sheltered and free from swell is the area surrounded by Tresco, St Martins and St Mary's. There are anchorages and beaches at every turn. Quite a breeze from the east this sunny morning. Had a lazy morning , fiddling with the batteries and solar panels and pushed off in the dinghy around mid day. The trip to the beach on Tresco is straight into the breeze and a wee bit wet. Destination is the famous Tresco Abbey and Garden. 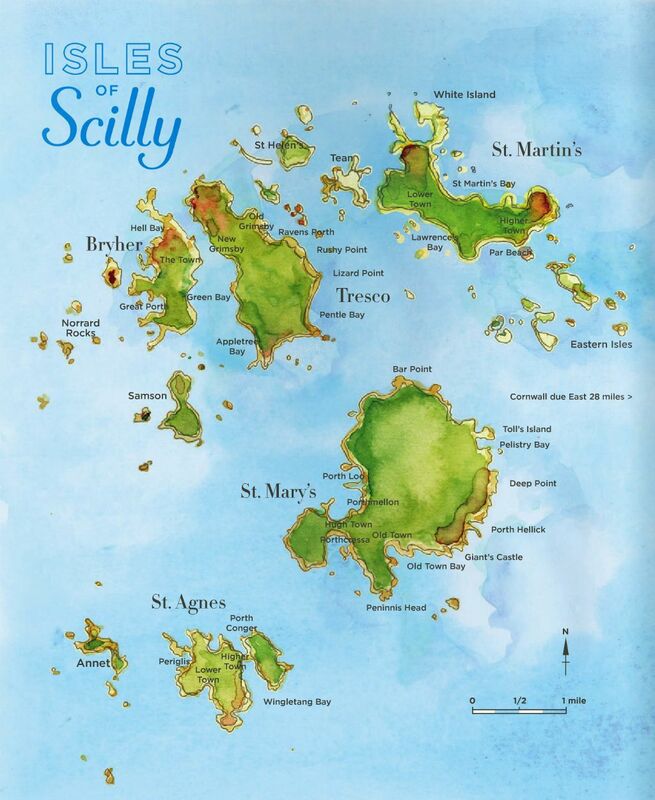 Gardens are not really my thing, but it would be churlish to come all the way to the Scillies and not visit. The original Benedictine Tresco Abbey was in ruin by 1350, probably destroyed by pirate raids. In 1835 Augustus Smith had taken the lease of the islands and built a new "Tresco Abbey" as a private house. The gardens were developed and extended with plants brought in from all over the world. 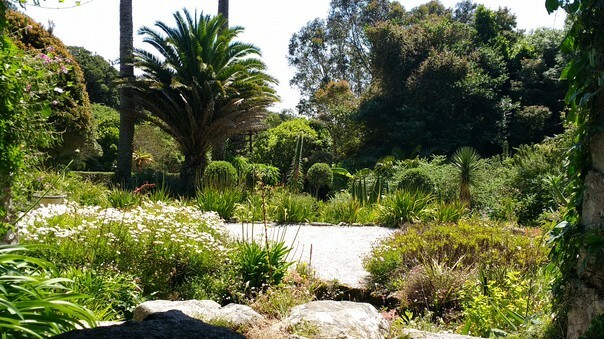 The mild Scilly winters and long hours of summer sunshine allow many exotic plants and trees to thrive. An impressive gateway appears to be the entry to the gardens, but no, it is the entry to the private residence of the Dorrien Smith's. For ordinary punters, the entrance is as far away as possible at the other side of the site! Entry is £15. The gardens are fairly small, compact, but very attractive. A basic map of 30 places of interest is provided, but there is not a signpost or marker within the gardens to confirm what you are looking at, or where you are! The weather was very hot and sunny, but on a wet day, a visiting couple might better spend £30 on a nice lunch. 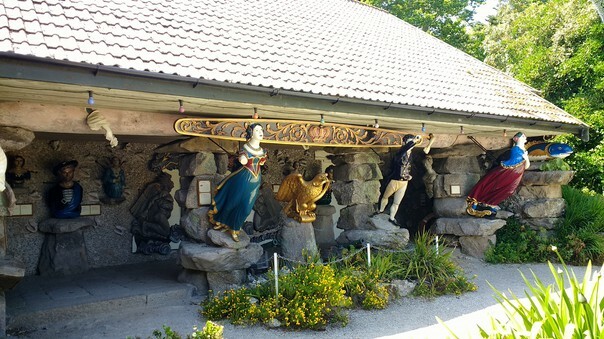 The collection of figureheads from ships wrecked locally was interesting, but many came from "vessel uknown". Showers and toilets for visiting yachtsmen on the Scillies are like hens teeth. It was a few days since I had enjoyed a shower. However, the only pub/hotel in New Grimsby Harbour, the New Inn, offers a shower for £2.50 or £3 if you need a towel. I call there on the way back from the gardens. A shower, a pint of IPA, a packet of crisps, the sun is still shining and the wind has dropped - it does not get much better! Very little wind this morning. It promises to be a very hot day. When I launched Dark Star at Milford Haven Marina after the winter break, the diesel engine revs dropped almost to nothing before picking up and running smoothly. Thinking that air had not been purged completely from the system when the fuel filters were replaced, I was happy when the symptoms disappeared pretty quickly. Since taking up a mooring here in the Scillies, it's been necessary to run the engine each morning to re-charge the batteries. The solar panels are not really sufficient. The erratic running of the engine returns, but much worse. I suspect that I have picked up contaminated diesel fuel, probably containing water. This morning I strip everything out to track down the problem. The first filter acts as a water separator for any contaminated fuel. Water is heavier than diesel and drops to the bottom of the filter where it can be drained off. With red dye in the diesel, there is no mistaking if water is present! However the drained fuel looks perfect, not a drop of water. Thoughts that the fuel pump could be on the blink produce steadily mounting panic. Checking around with a spanner, making sure all is tight, the central bolt holding the fuel filter together turns easily. 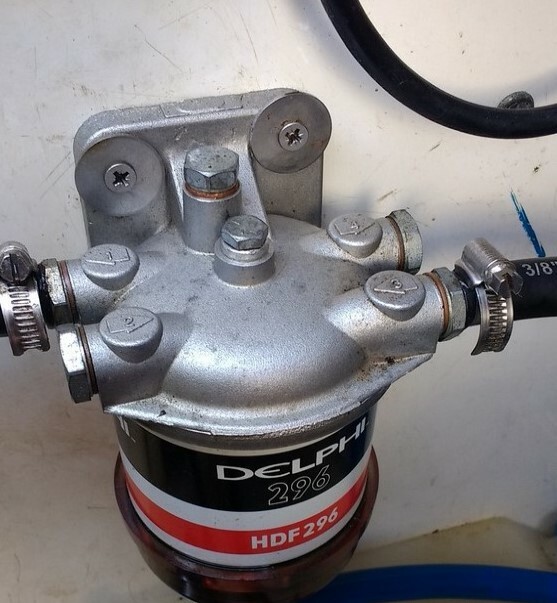 The bolt is tight enough to stop fuel leaking out, but loose enough to allow air to be drawn into the fuel! A tightening turn with the spanner and the engine is back running as sweetly as ever. Presumably vibration had caused the securing bolt to loosen slightly. Panic over, but must keep an eye on that bolt. 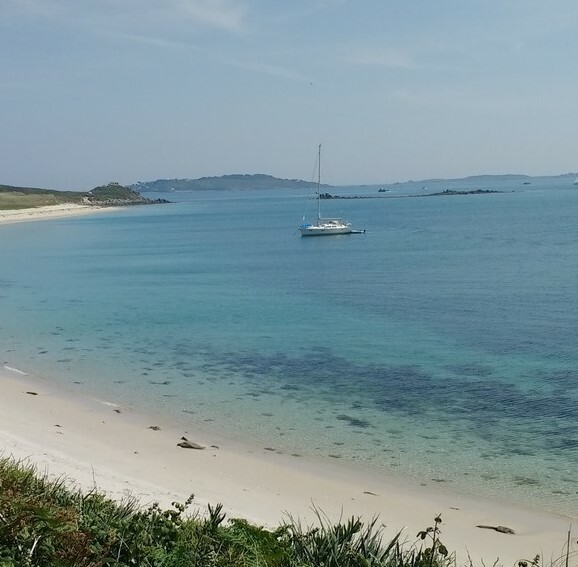 In the afternoon, I take the dinghy across to the sandy beach nearest the Tresco Estates Office and fill up two ten litre cans with diesel. I go for a ramble over the north side of Tresco and ended up outside the Tresco Gardens cafeteria where they do a grand pot of tea. On the way back, meet up with a group of yachties from Falmouth and receive some useful advice about my next port of call. The receding tide has left the dinghy stranded a long way up the sand. Moving a dinghy plus outboard engine, is easy with two people, but it's a pain single-handed. By the time the dinghy is back in the water, complete with outboard and the two cans of diesel, the hot sun has produced a thirst. The dinghy seems to find its own way across the water to thebeach nearest to the New Inn where a pint of IPA, a packet of cheese and onion crisps and some good banter with yachties newly arrived from Ireland, finishes off the afternoon nicely. The weather appears to be breaking down but there appears a window on Thursday to make the 65 mile trip back to the mainland and Falmouth. It will be a thirteen hour trip, but the forecast north westerly 4/5 should provide a good sail with the wind from behind most of the way. Over time, a force 5+ wind with 20 mph gusts raises quite a swell and is a bit on the limit for septuagenarian solo sailors, but this is the last "difficult" leg of the trip, across a bit of the open Atlantic. Chickening out is not an option. I need an early start tomorrow, but low tide will prevent a departure from here if I stay overnight. Moving this afternon from here (Tresco/Bryher) to an overnight anchorage in the Cove at St Agnes/Gugh would also save at least an hour tomorrow's trip back to the mainland. The plan is to leave here for St Agnes on the high tide at 14.00, but at 10.00, mist and fog descends. It's a tricky passage out over sands which dry at low tide, but I have charted the passage and can follow the track on my tablet chart plotter. I hope not to bump into anyone else doing the same. However, by 14.00 a procession of yachts also decide to leave and off we go into the mist which starts to thin as we approach St Mary's Sound. The plan to anchor overnight in the Cove in St Agnes starts to unravel as the wind is now blowing directly from the south, pushing swell straight into the anchorage. The only alternative is St Mary's "Harbour" which proved so uncomfortable when I arrived in the Scillies. St Mary's turns out to be jam packed, but after a search, I pick up the last available mooring buoy at 15.30. During the night the wind moves around to west north west and sends the moored yachts into the "St Mary's Jig". After a restless night, I rise at dawn and by 06.00 am, ready to go. The forecast has changed a little so the wind is more westerly than north westerly, but should still push me nicely along. A twelve hour trip means that for six hours the tide will be against and six hours in favour. For the first six hours speed is down to 4 knots, sometimes less. The wind is light which allows me to settle down in the boat without drama. However once clear of the islands, the wind increases to west north west force 4/5. For the next 8 hours, the course steered will be 90 degrees. Unfortunately the wind is opposing the ebbing tide and it is bumpy with breaking wave crests. A fair swell builds up. I take down the main sail and fully extend the big genoa (foresail). This balances the boat so well that the auto pilot is able to cope with the bigger swells which push the stern sideways as we slide down them. Soon heavy cloud produces rain and despondency. Around 12.30, 5 knots starts to flash up on the GPS. The tide has turned and the sea is less disturbed. Almost on cue, the sun comes out. The wind has increased as the colder, but brighter weather system arrives. The swell builds further and for the next 4 hours, Dark Star rushes along at six knots plus, riding the breaking crests in exhilarating fashion. Not an experience to forget! Probably one of the worst headlands in the UK for yachtsmen to navigate is The Lizard peninsula which sticks out much further to the south than does Lands End. The incoming tide from the Atlantic hits this promontory where the sea bed rises sharply from 75 metres to 35 metres. It's a huge underwater beach and throws up very disturbed seas. 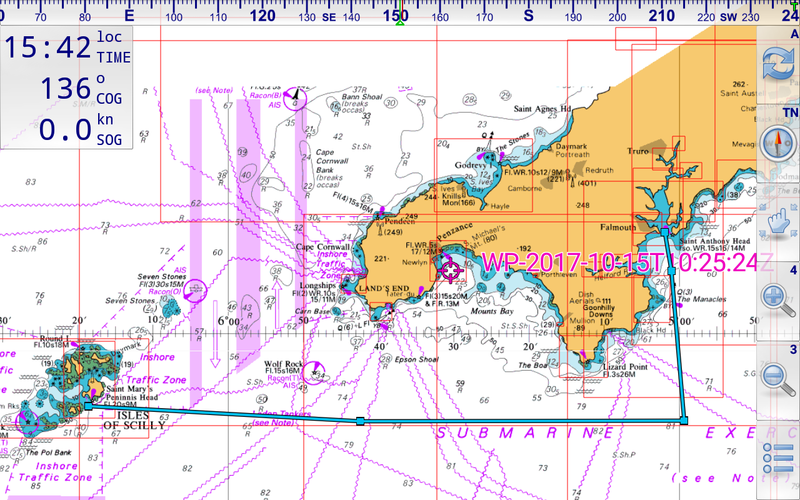 Fortunately, coming from the Scillies, my course takes me well offshore and out of the clutches of the dreaded Lizard, but at 16.30 I have to change course to reach Falmouth which lies to the north of the Lizard peninsula. Changing from 90 degrees to 40 degrees, brings the wind closer to the beam so that instead of running before the seas, Dark Star is now sailing across them on a beam reach. This is often the fastest point for many yachts. The GPS is now showing speed over the ground as 8 knots, the favourable incoming tide adding 2 knots to my speed. All the way up the 12 mile run north to Falmouth, speed over the ground never drops below 7.8 knots and I enter Falmouth harbour at 18.30, covering nearly 70 miles in twelve and half hours. I make my way to Falmouth Haven Marina, the usual first call for visitors, to finds boats rafted three and four deep. There is indeed "no room at the inn". There are visitors' mooring buoys available out in the harbour so I potter over to them. The wind is still very gusty and the large green visitors' moorings have no pick-up buoys. Using the boat-hook, it proves impossible to hold on to the ring on top of the mooring buoy, whilst attempting to pass a securing rope through the ring which is just out of arm's reach, 3 feet below. My next trick is to lassoo/ throw a loop of rope over the boy to secure it. First attempt the wind blows the rope back at me; second attempt I stand on the xxxx rope and nearly personally lasso the buoy. On the third attempt the rope goes nicely over the buoy, but does not sink into the water fast enough and just as nicely slides back off the buoy. "Monsieur" comes the call from a French flagged yacht already moored. "My buoy 'as a peeze of rope pour vous". Their mooring buoy has a pick-up strop and they offer to vacate that mooring so that I (single handed) can pick up the mooring easily via the pick-up strop. And that is what this kind French couple do. Now moored 50 yards apart it is difficult to express adequate thanks. Merci beaucoup. Vive La France! An unpleasant blustery morning dawns I phone Falmouth Marina (a Premier Marina) which is in a quieter corner of the harbour to request a berth for two nights. "Sorry we have nothing available". I leave my mobile number for contact should a space become available. 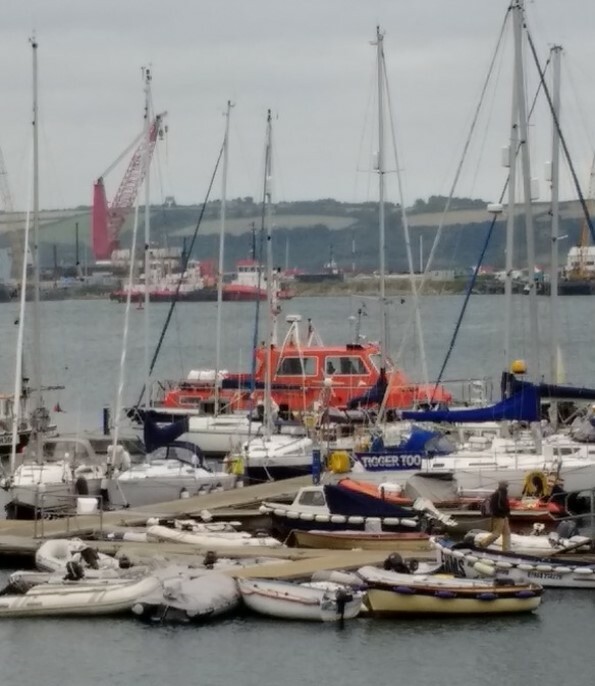 Shortly afterwards a work boat from Falmouth Haven Marina ties alongside with a very pleasant young lady, who originally came from Steyning and whose mother now lives in Shoreham By Sea! Sure enough at 12.30 a phone call advises that there is space for Dark Star on the inner pontoon. The harbour is covered in boats of every kind and to my request for more specific directions, marina control replies "head for the Water Taxi". The weather looks poor until Monday which suits me since I like the look of Falmouth. There seems a lot to see and do here in the next couple of days. 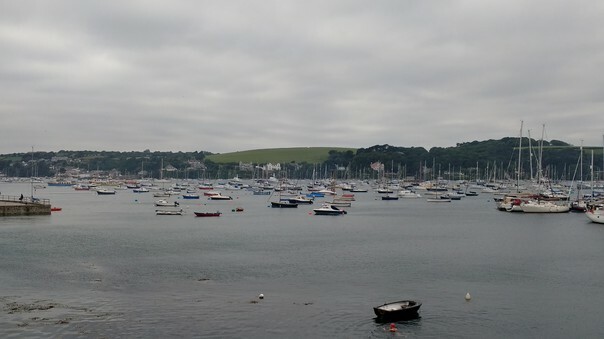 This in not near peak holiday time yet it seems that Falmouth is struggling to cope with the number of visiting yachts. Here in the far south west, French flagged yachts are remarkably numerous. After Brexit this could all change?